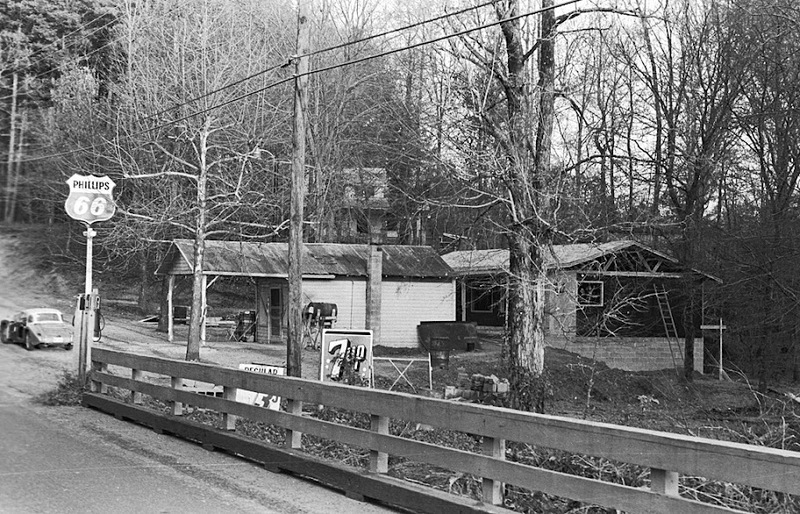 The Hollow Rock Store graced the banks of the New Hope Creek at Erwin Road from about 1930 until 1999. It had two incarnations. The first store, shown in this 1972 photograph, was built and owned by John Ransom Whitfield. John Brown rented the store from Whitfield and operated it for nearly 40 years. 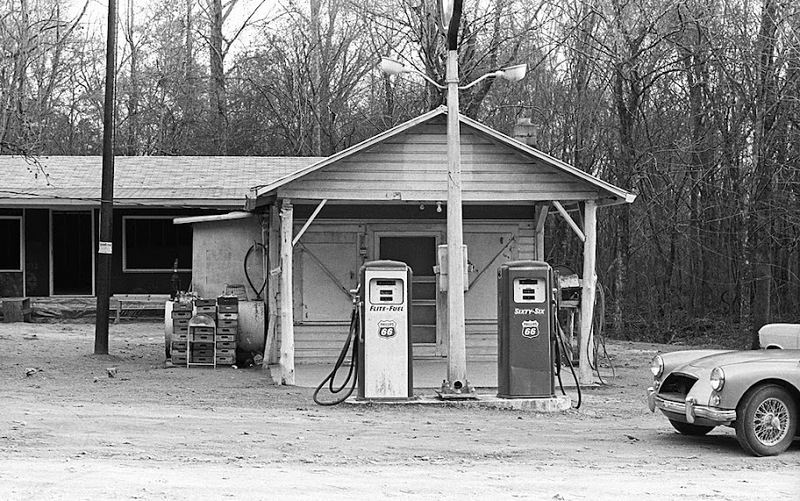 The store sold groceries and gas, and served as a polling place on election days, in addition to being a significant community gathering place. 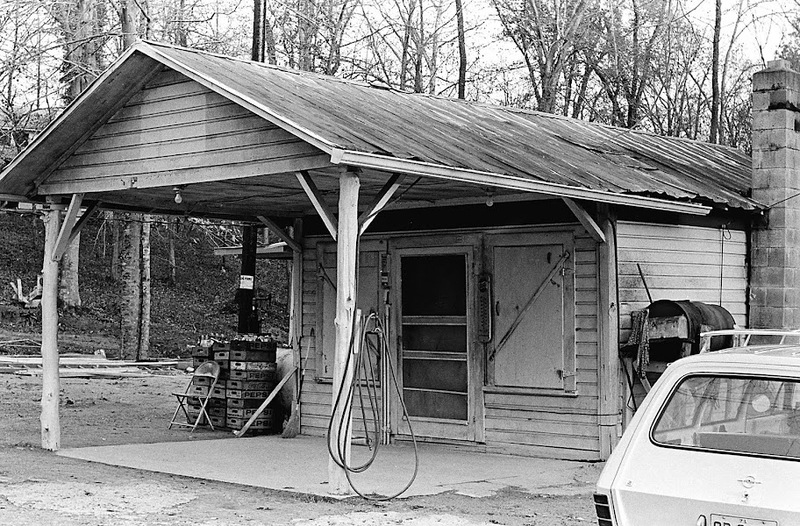 "[My wife] Bobbie and I bought our gasoline and notions from John Brown at the Hollow Rock Grocery on Erwin Road at New Hope Creek. John was a soft-spoken gentleman, probably about as old as our century. He would gladly note down your "box spaghetti" and five gallons of regular, and you didn't have to pay till Saturday. Sometime after he knew us well enough to extend this trust, he also told us about the music gatherings at the store on Friday nights after closing." "I can't remember for sure when we first attended, but it was probably in the winter of '64 and '65. There were two or three standers around that night, one guitar player who knew pretty much when to hit the chords but not which, and another who was a good country strummer and fine singer. His name was Tom Turner. John was a fiddler and banjo player, but too shy to be heard in a crowd. He was the first person besides myself I'd ever seen "frail" a banjo. His playing didn't sound like mine, or even look like what I'd been learning from Seeger's book. John called his method "knocking" the banjo, and he hadn't learned it from any book. He wasn't familiar with the term "frailing." That was my first lesson in regional and individual stylistics. I've since heard that peculiar way of sounding the strings (i.e., with the back of one's fingernail), called flailing, rapping, downpicking, clawhammer, and "that old clubfisted way." Not only do the terms vary from place to place and person to person, but so, to a degree, do the method and the sound. Seeger had adapted his method from a banjo man in eastern Kentucky." "The Hollow Rock Grocery was the kind of store you could stand in the middle of and reach all merchandise. Bobbie and I became regulars, and one night when a few extra listeners dropped in, the little store began to bulge. We offered to move the whole shebang to our house, and thus initiated a weekly event to rival in cumulative attendance any secular gathering in the history of Durham County except sports. By the summer of '66, it would be common to have 150 people in and around our house on any given Friday. And the party went around the year. Every Friday night except Christmas, Easter, and any major fiddler's convention weekend." "Most of the locals dropped out early on. I think they were put off by an untraditional household where the woman held a job and went to work, the man wore canvas shoes and went to school, and drinking was permitted indoors. But Tom Turner stuck with us. He was a winning singer with a seemingly endless repertoire of bluegrass and country songs. Bobbie and I had pretty much figured out harmony singing, and the three of us would stand in the living room and sing everything Tom had the patience to teach us. He usually brought along his son Jerry and sometimes a slim, shy fellow with tattoos who worked in the "powder room" at the BC plant. He was a wonderful singer, and I wish I could remember his name. When he joined us, I'd drop down and sing bass, and we had four-part harmony. I was still working on bluegrass banjo at the time, though it was a pretty blunt instrument in my hands. At least it gave us one melody instrument, and we all pretended it sounded OK and made us into a band. We'd practice on Sunday afternoons and then play what we'd learned for fun on Friday nights. There were always a few people around to listen, and I was having the time of my life. The fireplace had a built-in mirror over the mantle, and I used to sneak glances just to see how much we looked like a band." 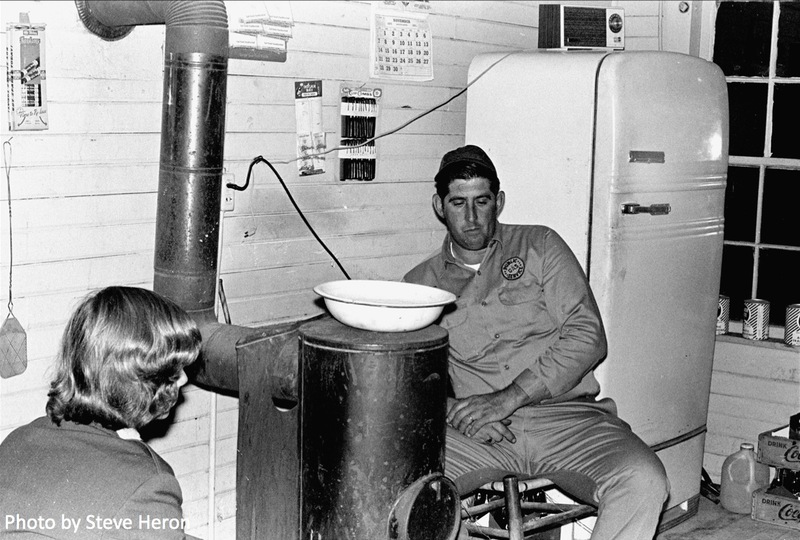 In this 1972 photo, Linwood Crabtree (right) makes himself at home at the store, enjoying a neighborly conversation. New Hope Creek Corridor Advisory Committee member Bill Olive remembers sleeping in that store one damp night in 1931, when he was just a boy. Bill's family had gone camping on a rock near the creek. When it started pouring rain, they went to the store and John Brown took pity on them and agreed to let them sleep on the floor until morning. 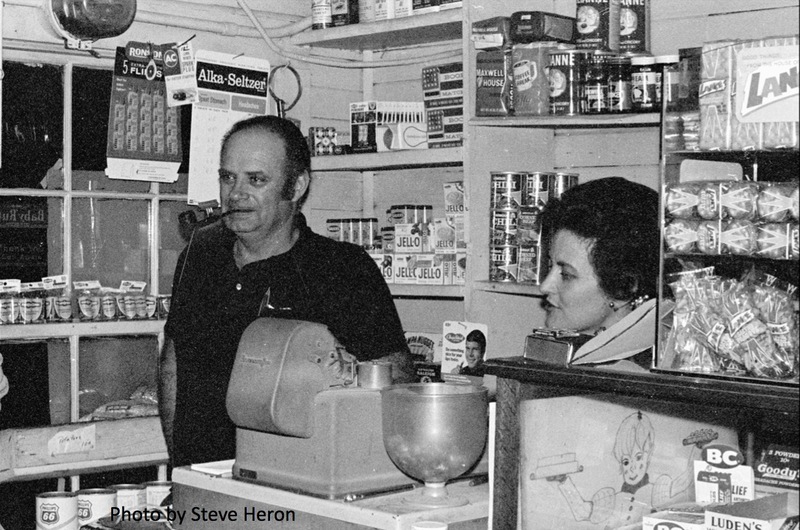 Around 1969, John Ransom Whitfield's son (John Glenn Whitfield) and grandson (Stanford Whitfield) took over operation of the store. The Whitfields soon decided they needed more space and announced plans in 1972 to tear down the old store and build a new one. Hollow Rock patron Jan Gregg told them she'd like to use the old store as her pottery studio. The Whitfields agreed and Gregg had the store moved to her nearby property. It served as her studio for nearly 20 years, and was used for storage after that. When DOT made the decision to replace the adjacent bridge in the 1990s, the (replacement) Hollow Rock store was deemed obstrcutive to that progress and torn down. In 2006, the location of the old store came to the attention of local activists working to establish the New Hope Preserve, which will have a major access point at the site of the Hollow Rock store. Local activists have begun talking to Jan Gregg about having the store moved back to (or near) its old site, to serve as a focal point of the preserve.